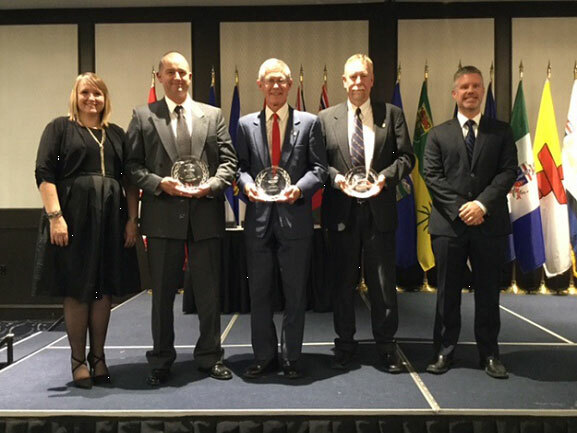 (From left to right) Stéphanie Durand - Director General, Policy and Outreach Directorate, Emergency Management Branch, award recipients Colin Cackette, Phil Whitfield and Michael Murray, and Dominik Breton -Director of National Search and Rescue Secretariat. Mr. Phil Whitfield, a volunteer for the Alberta/British Columbia Cave Rescue Service, is the 2016 National SAR Program Award of Excellence Recipient in the category of Exemplary Service. Mr. Whitfield has more than 32 years of consistent dedication to the search and rescue community. Since first registering as a provincial emergency program volunteer in 1981, he has made a lasting impact as the founder and provincial coordinator for BC Cave Rescue, a long-time member and one-time president of Kamloops Search & Rescue Society, and serving on a number of SAR Advisory and technical committees. Mr. Whitfield is a certified rope rescue instructor and has a long and sustained contribution to both the Provincial Emergency Program and the Justice Institute of British Columbia in this capacity. The Alberta/British Columbia Cave Rescue Service has grown to 180 current, trained members, and over the last 30-plus years, Mr. Whitfield has trained more than 600 individuals in cave rescue. Considering that the caving community in the region is relatively small, with about 200 individuals belonging to organized caving clubs at any time, it’s clear that Mr. Whitfield has met his vision to “mainstream” cave rescue skills within this community, with cavers viewing rescue skills as a responsibility and an obligation to uphold. Mr. Whitfield has also been a leader in a number of major cave rescues, and has continued to revise his training and course material to reflect the realities of rope rescues. Through the delivery of this updated training, he will continue to leave a legacy in the region and in the SAR community at large. Mr. Michael Murray, of Kildoon Emergency Management Consulting and Training, is the 2016 National SAR Program Award of Excellence Recipient in the category of Education and Training. Mr. Murray is a long-standing member of the Nova Scotia Provincial Ground Search and Rescue (GSAR) Committee. Mr. Murray has provided search management and incident command system (ICS) training for more than 25 years for the province’s GSAR volunteers and has been instrumental in developing ICS and Search Management curriculum and publications. Mr. Murray first joined the Halifax Regional GSAR team in 1986, beginning as a basic searcher and rising over time to the position of Search Manager. His commitment to education and training in the SAR community has followed a similar trajectory. In the classroom, and in the field, Mr. Murray is passionate in his belief that principled management is based on strong values, open communications, mutual respect and teamwork. This is demonstrated in his ongoing commitment to provide the highest quality training and education to the GSAR community, often in a volunteer capacity. Mr. Murray also played an important role in terms of education and training via his work with the Nova Scotia GSAR Standards, the Nova Scotia GSAR Committee, and the Canadian Standards Association SAR Volunteer Association of Canada (CSA SARVAC) project. Mr. Murray was a driving force in implementing a Standards document for Nova Scotia which has been shared with other jurisdictions and is recognized as a best practice in many parts of the country. His work on the Nova Scotia Standards also served him well during his commitment with the CSA SARVAC national standards where he was one of the main players in developing a standard for the Search Manager role that has now been accepted nationally. Mr. Colin Cackette, an Executive Officer, K9 Unit Manager, and Training Manager volunteer with the Ontario Community Emergency Assistance Program (OCEAP), is the 2016 National SAR Program Award of Excellence recipient in the category of Leadership. Mr. Cackette has 16 years of SAR volunteer experience in a number of roles with the Ontario Community Emergency Assistance Program. He has demonstrated remarkable leadership both within the OCEAP family and in forging relationships with the local emergency management community and the public. Among OCEAP members, Mr. Cackette is known as a patient and approachable leader who takes every situation as a potential learning opportunity, especially among new SAR crew. His emotional intelligence is also recognized, particularly in supporting crew members who have met with traumatic circumstances in the field. Mr. Cackette also took initiative to stand up the OCEAP’s K9 Unit, by training his K9 partner, Dodge, and leading on the delivery of K9 training for the OCEAP. Mr. Cackette has also been very proactive in setting up meetings with the local police chiefs to familiarize them with the OCEAP and the support they can offer. This partnership has led to increased coordination between local police and OCEAP, including OCEAP support for both search and rescue efforts and other community events. Mr. Cackette’s engagement with the local Emergency Management Team in Coburg resulted in OCEAP participating in a mock disaster exercise and other new partnership. In terms of community engagement, Mr. Cackette has also taken great strides to familiarize the Northumberland community with SAR and SAR prevention, and recently organized a fundraiser for OCEAP as part of these efforts. Clearly, Mr. Cackette’s dedication to community partnerships and to team-building efforts within OCEAP is tireless, and will continue to have a lasting impact on the Northumberland communities.